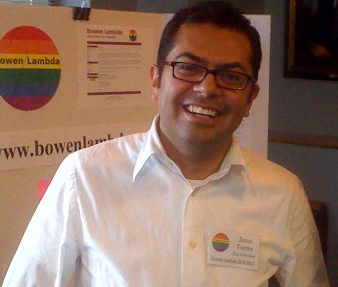 Jesus Torres joins The DOMA Project this month as a legal intern where he will be involved in legal research and advocacy for our growing docket of cases involving lesbian and gay binational couples who are facing deportation, separation or exile because of DOMA. Jesus immigrated from Mexico with his family to the United States as a child. He graduated from the University of Dallas in 2005 with a degree in Psychology. He is currently attending the William H. Bowen School of Law at the University of Arkansas at Little Rock where he is vice-president of Bowen Lambda, the LGBT law students organization and a member of the Hispanic Law Student Association. Last summer, Jesus worked at the National Hispanic Bar Foundation in Washington DC where he was a mentor in the Future Latino Leaders Law Camp. Before going to law school, Jesus worked in the Dallas office of the the large national law firm, Akin Gump Straus Hauer & Feld, and as an immigration paralegal at the Dallas law firm of Reina & Associates working primarily on family-based immigration cases. We are please to welcome Jesus to The DOMA Project.